Formula E is going completely autonomous with the all-new Roborace series slated for the upcoming race season. 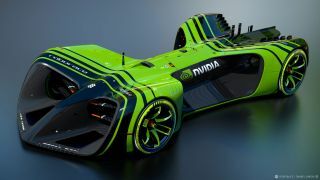 At its GTC developer conference, Nvidia announced these autonomous, electric race cars will be powered by Nvidia Drive PX 2, a supercomputer built for self-driving cars. Drive PX 2 is powered by 12 CPU cores and four Pascal GPUs that provides eight teraflops of computer power. The supercomputer-in-a-box is vital to deep learning and trains artificial intelligence to adapts to different driving conditions, including asphalt, rain and dirt. As for the vehicles themselves, each Roborace car is completely electric and weighs 2,200 lbs – slightly less than Mazda Miata (MX-5 for everyone outside of North America). The lack of a driver cockpit let Daniel Simon – the man responsible for the Tron: Legacy light cycles – come up with a crazy, hot wheels inspired design. The Roborace consists of 10 teams controlling 20 identical cars. It's a test of AI skill that piggybacks off of Formula E races. Roborace and Formula E share the same race schedule and courses, but the AI-driven races will hit the track first.